L-R: David Kamida, Coordinator, Hawaiian Airlines Social Media Marketing; Asiana Ponciano, Specialist, Hawaiian Airlines Social Media Marketing; Brad Watanabe, Filmmaker, Berad Studio. 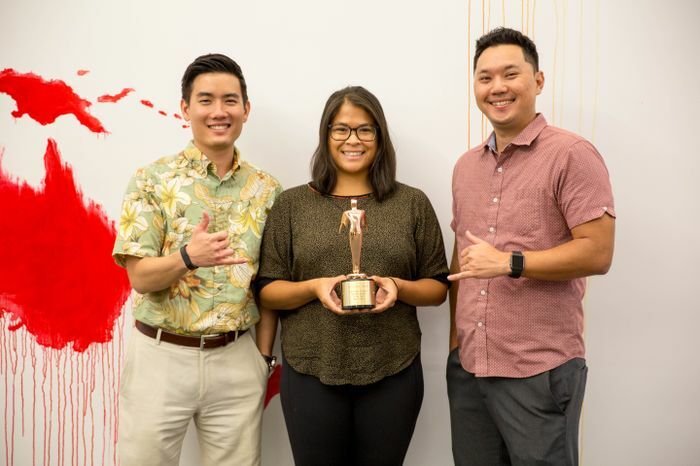 Hawaiian Airlines' 2014 holiday time lapse video titled “Happy Holidays from Hawaiian Airlines – Carol of the Bells” was recently named winner of the Telly Awards Best Online Video in the Travel/Tourism category. The winning video can be viewed here. The video was a part of a series, released via social media last December, that shared the spirit of Aloha during the holiday season. The time lapse video took place across the state and featured an ukulele cover of “Carol of the Bells” by Mountain Apple artist Kalei Gamiao. The time lapse video performed the best out of the three series of videos with over 102,000 views and over 12,000 Likes on Facebook. The full list of Telly Award winners can be found here.